Indian Attack on the Village of St. Louis, by Oscar Berninghaus (1924). From a mural at the Missouri State Capitol. The Spanish role in the American Revolution, especially in the war in the West, is little remembered today. But along with France, Spain had suffered a bruising defeat at the hands of the British just a generation earlier, in the Seven Years’ War (French and Indian War in America). There was no love lost between Spain and Great Britain, and the Spanish were only too glad to give aid and comfort to the Americans trying to throw the British off this continent. Fernando de Leyba was the highest-ranking Spanish official in the American West. Based in the village of “San Luis des Ylinueses” (St. Louis of the Illinois), he held the rank of lieutenant governor, but was responsible for the vast territory of Upper Louisiana, also known as the Illinois Country. This territory was still almost unknown to most Europeans, but was believed to hold incredible riches in furs. The Spanish had done almost nothing to defend the territory above St. Louis, and the British were starting to move into present-day Iowa, Minnesota, and Wisconsin when the war began. De Leyba and his family trekked to this remote outpost of the Spanish Empire in 1778 with orders to keep tabs on the dust-up between the Americans and the British and try to exploit it for Spain’s benefit. If all went well, Spain could hope to regain the Floridas, lost to Britain in the earlier war. With even better luck, Spain might seize the entire Mississippi Valley. De Leyba couldn’t have arrived at a better time. George Rogers Clark was fresh from raising hell in Kaskaskia, then a thriving Creole settlement that was a key supplier of wheat and corn to New Orleans. Clark and his Virginia militia had seized the town in a bloodless raid that nonetheless spread “shock and awe” through the remote frontier settlements. It appeared that far from conceding the West to the British, the Americans were ready to make a stand for it. De Leyba invited Clark to cross the river and meet with him, a prospect that filled Clark with uncharacteristic apprehension, “as I was never before in Compy of any Spanish gent.” For his part, de Leyba had undoubtedly heard of Clark’s startling, savage appearance in Kaskaskia, which he and his men seized barefooted and wearing only hunting shirts and breechclouts. Fortunately, Clark turned out to have a servicable Virginia officer’s uniform, and de Leyba was friendly and ready to help. At de Leyba’s urging, many local merchants extended Clark credit and invested heavily in his cause, provisioning Clark’s troops with guns, powder, and knives; linen, cotton, and buttons for clothing; and brandy. 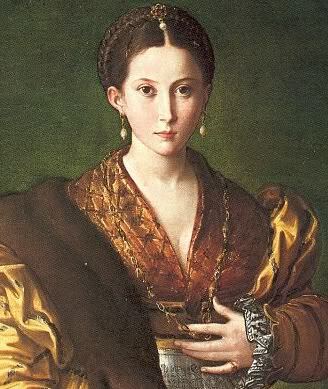 According to legend, the Spanish governor also encouraged a romance and possible marriage between his teenage sister Terese and George Rogers (who was only 26 years old at the time). Despite the difference in religion, it’s more than plausible that de Leyba would have thought Colonel Clark was a pretty good catch for his little sister. Not only were he and Clark friends and allies, but Clark was the scion of a prominent Virginia family, and likely to win large land grants as a result of his exploits in the West. Disappointingly, the story of the love affair is based on fairly flimsy historical evidence. Some letters from Clark’s friends hint that he was engaged in an intense and passionate romance with someone in St. Louis. However, no direct evidence, such as letters between George and Terese, has ever come to light. In fact, Terese left behind so little documentary evidence of her life that some historians have suggested that she was too young to have been a love interest for Clark, that she never lived in the New World, or that she didn’t exist at all. Many of de Leyba’s subjects, who were almost all French Creoles, soon began to wonder if their Spanish governor had backed the wrong horse. After all, his fighting force consisted of only 16 regular troops and a citizen militia of about 176 men (the total population was a mere 700). Moreover, Clark’s credit was only as good as the soundness of the Continental currency and the State of Virginia’s willingness to reimburse his expenses — which turned out to be not very, and not at all. Before long, as one trader lamented, a Continental dollar “wouldn’t buy a cat” in St. Louis. Merchants who had backed Clark soon began besieging de Leyba to make good on the American’s bad credit. Defenses of Spanish St. Louis. Fort San Carlos is in the background. Like most of the early Spanish governors, de Leyba found himself unloved, more or less abandoned by Spanish officialdom, and sick with frontier disease (probably malaria). In the summer of 1779, de Leyba’s wife died, and he suffered an illness that permanently affected his health. In the spring of 1780, the British launched a major offensive intended to roll back Clark’s victories, seize control of the entire trans-Mississippi West, and eventually launch an attack on the American colonies from the rear. Most of the troops, some 1300 strong, were Indians under the loose command of British officers. The attack on St. Louis came on May 26, 1780. The Creole population, which mostly regarded both de Leyba and Clark as nuisances, had paid little heed to the warnings of war. Most of the townsfolk, both free and slave, were outside of de Leyba’s makeshift walls gathering spring strawberries, when, as de Leyba wrote, a force of 500 Indians burst upon the town “like madmen, with an unbelievable boldness and fury, making terrible cries and a terrible firing.” Within minutes 40 civilians had been killed. De Leyba’s fort saved the day. The governor and his men rushed to their posts and unleashed a bombardment of grapeshot from five small cannon he had deployed in the tower. 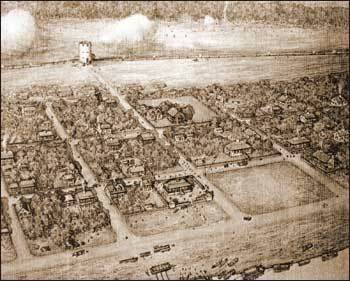 At the same time, George Rogers Clark’s tiny force repulsed a similar assault on the French village of Cahokia across the river. Incredibly, British intelligence had failed to discover that the town had been fortified, and Indian troops were never big on sieges, much less suicidal charges. 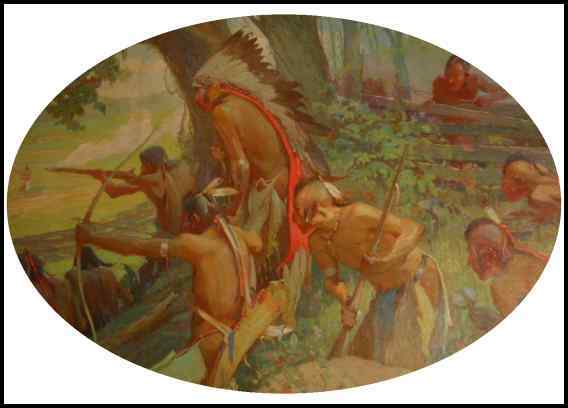 The attack collapsed and the Indians turned their attention to raiding and burning nearby farms, slaughtering farm animals, and taking captives. In all, the death toll around St. Louis was over 100 — a heartbreaking 15% of the area’s population. De Leyba died just a month after the battle of San Carlos. Though posthumously promoted by his superiors for saving St. Louis, he died hated by the grieving inhabitants, who blamed him for the massacre. 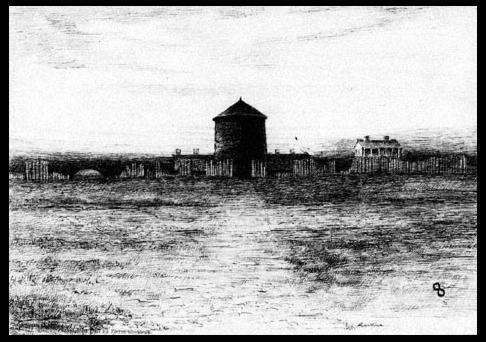 As for Fort San Carlos itself, the Spanish under the leadership of Manuel Gayoso strengthened the tower in the 1790s and surrounded it with a new stockade, a ditch, and several structures that could be used in the event of a siege, including a kitchen, well, barracks, powder magazine, and even a dungeon. By the end of the decade Gayoso had seen to the building of four new stone towers and a blockhouse. After the American takeover in 1804 and the construction of Fort Bellefontaine, all of the structures were used for other purposes. De Leyba’s stone tower was the town jail for some years. Eventually all of the Spanish buildings were torn down so that the stone and wood could be used in other projects. The Fort San Carlos tower went in 1818. Though de Leyba and the stunned inhabitants could never have known it at the time, the consequences of the Battle of San Carlos were anything but minor. Because of the Spanish and American victory at San Carlos, the entire British campaign in the Mississippi Valley dissolved in finger-pointing and disarray, and Indian troops headed for home. The Spanish could add the result to other victories they had won in Natchez, Mobile, and Pensacola. In short, the United States and Spain retained control of the West, and the Spanish retained possession of the Mississippi. If this small battle had gone the other way, the effect on American history could have been incalculable. 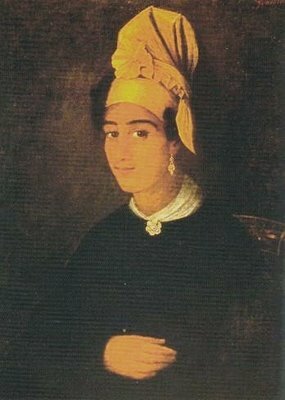 Mulatto Woman, 19th century portrait. Courtesy Historic New Orleans Collection. And what of George and Terese? Clark, along with many of his creditors, was ruined by the debts he incurred in the service to his country. He was in no position to marry anyone, let alone a Spanish noblewoman. Indirect evidence suggests that Terese waited for some time, living in New Orleans and hoping that George’s fortunes would somehow turn around. Romantically, she is supposed to have entered a convent rather than marry another man. James Alexander Thom’s book Long Knife centers around the ill-starred love affair. In our book, The Fairest Portion of the Globe, we have a different take. In 2006, we had the privilege of meeting Clark historian Jim Holmberg, who told us the intriguing tale of a possible latter-day romance in Clark’s life. It is this later love on which we have chosen to expand in our book. Even whiskey couldn’t burn the cold out of him. Lord knew he’d given it a fair try. The third time they met, he was sprawled on the floor in a corner at closing time, watching Marianne’s strong ankles as she grabbed the chairs and turned them upside-down on the tables so she could mop the beer and puke off the floor and sweep up the peanut shells. He had pushed himself up on his hands and knees and said No and began to weep. Floyd, counting his proceeds at the bar, hissed in disgust and said something about one of the finest farms in Louisville. For Christ’s sake don’t embarrass yourself, Floyd said. Go outside and wait by the ferry, I’ll take you back across tonight. She had come to him before Floyd ever showed up. He hadn’t gone back across the river that night.